1. The Hessdalen Lights: Theses lights appear in the sky as three separate lights that form a triangle; they come in colours of red, white and yellow. They tend to sit in the sky and flicker not far above ground level or streaking across the sky. There have been many sightings, one in 1977 by Harold Dale and his kids at 6:30pm. Records of these sightings go back to the 19th century, they were partially active in the 1980’s where there were around 20 reports per week. They remain an unsolved phenomenon although there has been many theories including: ironized dust, combustible particles in the air and of course UFO’s. 2. Time slip photographs: Although there are many photos on the internet that are clearly fake, this one appears to be different. However, there are a few that have been released by historical societies and museums that seem to feature someone that is very out of place for the time period. The image below came from the Virtual Museum Canada website in Columbia Britain. This photograph is from 1941, the man on the left is wearing a wrap-around goggles and a screen-printed shirt and a digital camera around his neck. This is just one of many legit photos, the woman in the background of the Charlie Chaplin film, The Circus, and the woman in the video from 1938 Massachusetts who appears to be talking on a cell phone. 3.UFO landing in Zimbabwean school playground in Ruwa: On the 14th of September 1994, 64 children witnessed four “round, silver and saucer-shaped” land on the school property. There was a “small man” standing on top of one of the vessels, he was described as thin, one meter tall, bug-eyed and wearing a one piece silver and black jumpsuit. He approached the children then suddenly disappeared, some children seen another small man behind one of the vessels but he soon disappeared too. The children told a teacher and they were asked to draw the little man and the vessel. In the end there were 35 drawings of what looked like a UFO and aliens. Scientists ruled out preconceived notions of aliens and UFO’s because of the children’s’ lack of exposure to these concepts. Doctor John E. Mack interviewed and examined the children and he concluded that the sighting was factual and not a case of mass hysteria. Through out the lives of these children they remained with the same story. 4. Twin sisters: In 1957, two sisters, 11 year-old Joanna and 6 year-old Jacqueline Pollock were in a car accident in Northumberland, England. A year later their mother had twin girls, Jennifer and Gillian. the younger twin, Jennifer, had birth marks on her body in the same places as Jacqueline had. The twins would ask for toys the deceased girls had which the twins should have had prior knowledge of. They also asked to go to the park that they had never been to but their deceased sister had. Dr. Ian Stevenson a psychologist who was well respected at the time, studied the case in-depth and concluded it was likely the twins were reincarnations of their departed sisters.studied the case in-depth and concluded it was likely the twins were reincarnations of their departed sisters. 5. 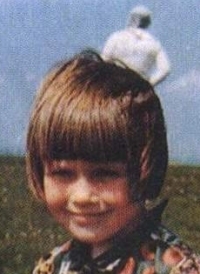 Spaceman: On 23 May 1964, Jim Templeton, took three photographs of his five-year-old daughter while on a day trip to Burgh Marsh. In a letter to the Daily Mail in 2002, Templeton stated, “I took three pictures of my daughter Elizabeth in a similar pose – and was shocked when the middle picture came back from Kodak displaying what looks like a spaceman in the background.” Templeton said he didn’t see the figure until the photos were developed; an analysts at Kodak confirmed that the photograph was genuine. There were only two elderly ladies in the Marsh but they were seated down the other end on a bench, they didn’t see anyone either. This man has been seen in other photos as well.